Home Uncategorized Pop-Unders on Network Solutions Parked Pages? Pop-Unders on Network Solutions Parked Pages? I recently noticed the webcam for Lowell.com was no longer functioning. 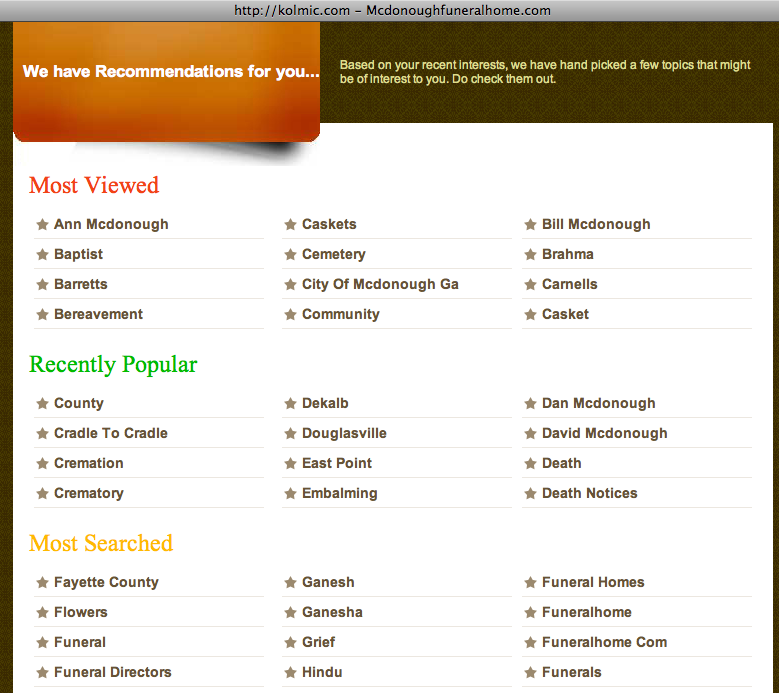 I visited the website of the funeral home that operates the webcam, and I came across a Network Solutions landing page. While I initially thought they must be making some changes to the site, I didn’t contact the funeral home to ask if something was amiss. Needless to say, I always have my pop-up blocker on, so I went back to the business of developing Lowell.com and didn’t really think twice. Today, while in the process of doing something that required me to disable my pop-up blocker, I noticed their site wasn’t working again. After seeing the Network Solutions landing page (image below), I clicked away and got a pop-under with PPC links on it. While the header of the pop-up says “http://kolmic.com – Mcdonoughfuneralhome.com” the body doesn’t look similar to anything of Network Solutions’. The domain name registration is current – and in fact registered through August of 2013. Has anyone seen this before? Is Network Solutions adding annoying pop-unders to their parked pages to monetize them even more than going beyond the standard single page PPC links or is something else going on here? evolanding pages have pop-ups and pop-unders; I was actually considering trying them because they emphasize that they’re content-heavy, but I find such spamming practices ethically unacceptable for my own business model. Let’s face it; all users hate pop-ups, pop-unders, advertising “welcome” pages, and sliders (those stupid ads that float across the page). Why do parking companies think that users will EVER return to such pages? As of 7:45 this evening, the Network Solutions landing page has disappeared and it now goes to a dead page. Yup, I have seen this in practive many times as I am doing research on domain names. I really don’t like this practice. Network Solutions = ethically challenged. poets.net is an active website, and I DON’T appreciate this BS. It even has a popup! How do we stop this stuff? I would never recommend Network Solutions anyone! They have horrible customer service and are always ‘down’. How are businesses supposed to run effectively when Network Solutions is such a scam?